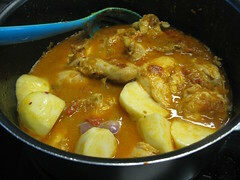 Well, I finally learned how to make my Dad's beloved chicken curry. A typical dish that my family would make, I've been enjoying this dish since as long as I can remember. This is the real deal, no yucky "curry powder" (curry powder as most Americans and Brits know it has absolutely nothing to do with chicken curry by the way) and no shortcuts. My Dad claims that the key to this recipe is browning the onions - if they are not browned properly, over a low heat and in plenty of oil for about 30 or 40 minutes, the dish won't have the same flavor depth. So I take you back to my childhood... enjoy! 1. Heat canola oil in a non-stick pan. 2. Add cloves, cardamon and cinnamon stick. 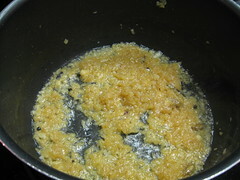 Allow to sizzle in the oil until the cloves double in size (about 1 minute). 3. Add the onions. Cook for low for approximately 30 minutes, stirring often. If it seems like the onions are sticking and burning, add more canola oil. 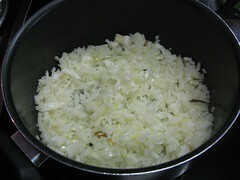 Onions are ready when they are golden brown and separated from oil. 4. 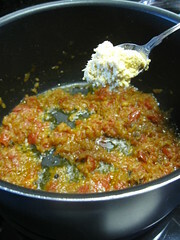 Add the tomatoes. 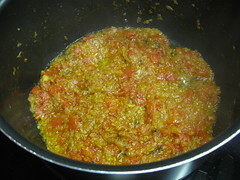 Cook until the oil separates from the tomato and onion mixture. 5. 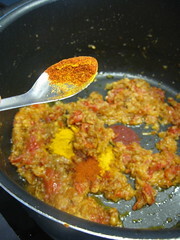 Add the garlic, ginger, turmeric, coriander, cumin and cayenne powders. Stir well. 6. Turn the heat up. 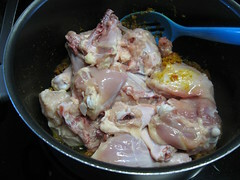 Add the chicken, allow the meat to seal on all sides (until no pink is showing). 7. Add enough boiling water to just cover the chicken. Bring to a boil and turn down to a low simmer. Cover with lid. 8. Cook on low using one of two methods - cook the chicken breast until just cooked, removing from the pan and adding back when the legs are cooked - about 1.5hrs, or, cook all the chicken on low for 2-3hrs until the meat is falling off the bone. Add the potatoes approximately 45 minutes before cooking time is completed. 9. Serve with basmati rice. 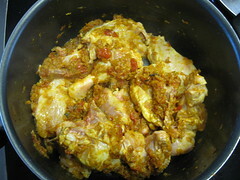 I always wanted to try out classic chicken curry. I'll be handing this recipe to suffolk county catering halls for my birthday celebration. Thanks for sharing.